Hi everyone, I hope you will all have a great week! 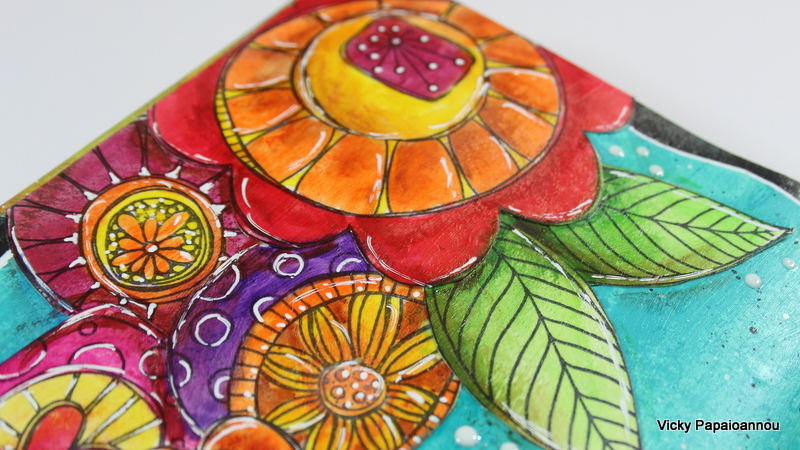 Today I am back with an art journal, a happy and very colorful one. I had so much fun coloring all those flowers and putting everything together! I promised I would post at least one art journal layout per month, so I made a second one for May! Yeah! 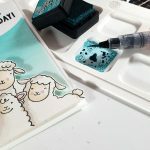 I got these stamps by PaperArtsy and I just had to use them ASAP. I kept my background blue and simple. So the colorful flowers really pop! I used by go to coloring technique, with big brush markers over matte medium. I also had a boo boo when I stamped the quote, but fear NOT! I will show you how I fixed it ! 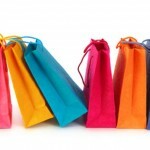 In honor of Memorial Day, Scrapbook.com is hosting a HUGE site-wide SALE! 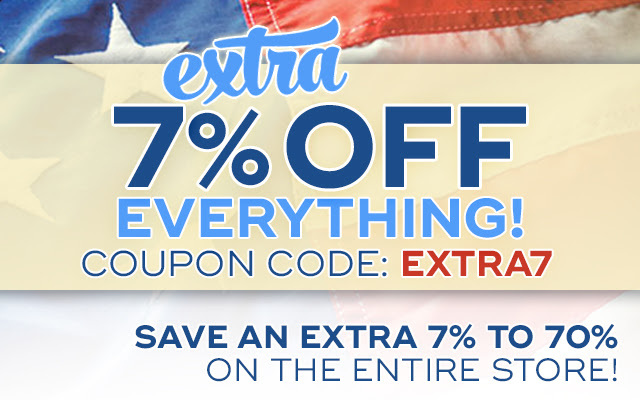 For 3 days only, take an EXTRA 7% off EVERYTHING in the Store! Many products are already on sale, so your final prices in the cart will be 7% to 70% OFF. Use coupon code EXTRA7 at checkout to see the additional discount. This coupon code expires on May 31st at midnight PST, so shop now HERE for the best selection. 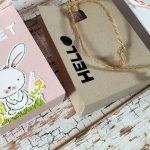 Links to multiple online shops provided. Affiliate links used below at no extra cost to you. Very fun, bright and happy! 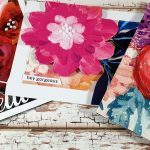 It’s just a stunning art journal page! I am glad you liked my designs. What you have done with them is stunning! Fabulous as always – I so look forward to these videos and your card videos too. You’re amazing! Love this layout, so bright, happy and whimsical. It’s like I tell the girls at our studio, no mistakes, just opportunities to be more creative and creative you were with that little boo boo. Thanks for sharing this with us. 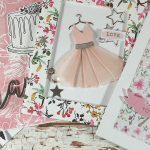 Love, love, love your art journal pages! Your videos inspired me to “create” My own art journal. I have just finished my 17th layout! Would love to share a few of my favorites with you! This looks like so much fun. I’m chicken to try it. This is such a fun and colourful layout, I cannot get enough of your work! TFS! So much fun to look at these pages, Vicky! 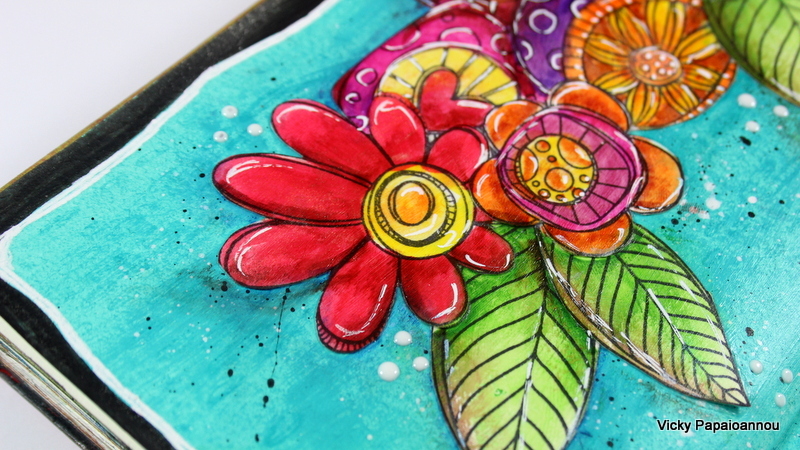 Big, bold and colorful pages always lift my spirits~ love these flowers! I love your artwork and your accent! 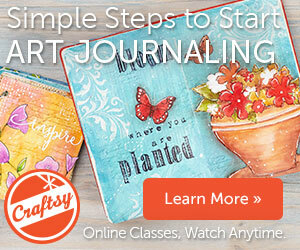 Love your art journal and your videos are so much fun – thank you so much for sharing your art! 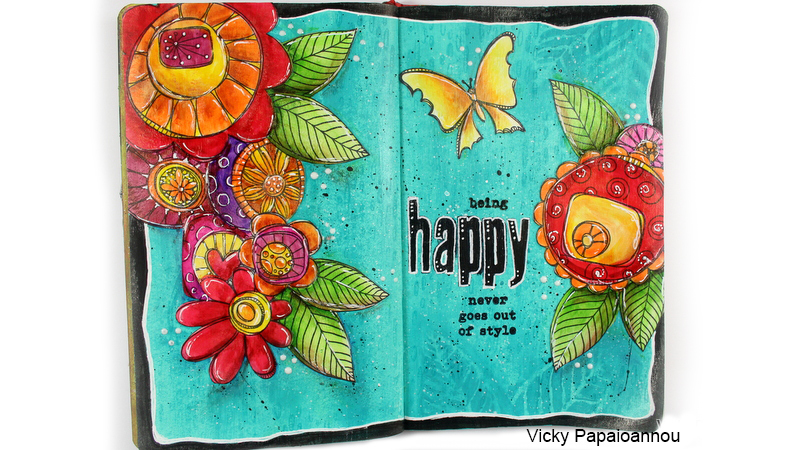 Vicky, this art journal piece is SO beautiful. I love the stamps you used, along with the paint colors you chose for the background. 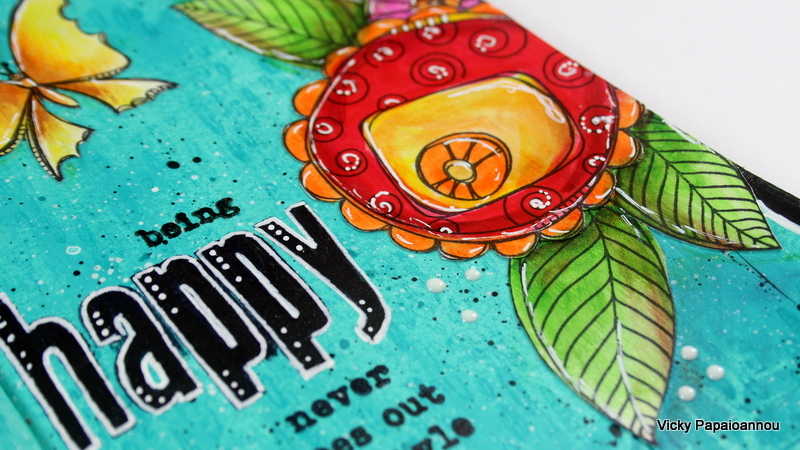 However, my favorite part is the wonderful colors you chose to color in your stamped images. Thanks for sharing. 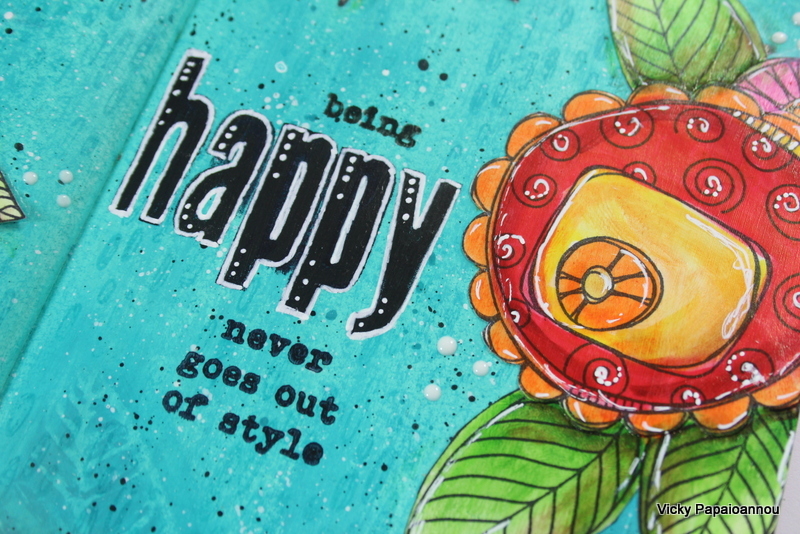 Just loved this happy whimsical art journal layout!! !The blues for the background are wonderful,as are the colourful flowers. You work magic with that white gel pen every time!! !Also great to see how you managed to correct the stamping,some good tips ,as so often it is the sentiment at the end that can go wrong!! Thanks for another great video.!!!! Such a cheerful page! I love watching you create journal pages. Thanks for a second art journal page this month! Watching you do art journaling is so inspiring. In fact, I’m joining some friends to do Julia Cameron’s (writer of The Artist’s Way) It’s Never Too Late to Begin Again and one of my art projects (I’m thinking) is to play more with mixed media! I’ve definitely been inspired by watching your videos!! Thank you, Vicky!!! 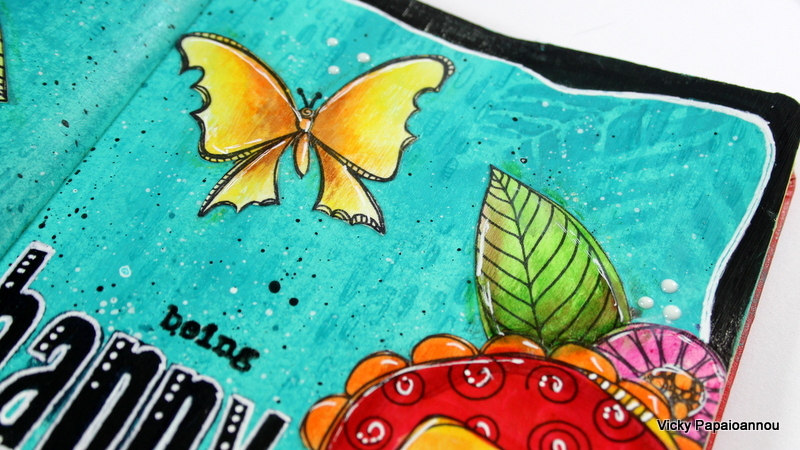 Your work is always fresh and fun; whenever a an art journal pages comes up it is definitely the treat of the month. I live in South America and we do not have most of the supplies but this becomes part of the challenge, just seen how I make do with what I have at hand . Love your Work! All the best! Such a beautiful page, truly happy. What a treat to watch you create! Keep it up, Vicky! Just looking at you layout makes me HAPPY! Thanks for sharing another amazing video. P.S. I love cutting out things too! Your pages are so wonderful and full of colours, I really adore your colour choices. Love your page! Thanks for sharing. Need to check out those stencils.